Vintage - Sadler English Porcelain Teapot, Ivory Background with Violet Bouquets, 22k Gold Trim, Artist Mark "H" in Gold on Bottom, Circa 1940-1950. This Lovely Cream or Ivory Vintage Teapot, made by Sadler in England, has a Pattern that seems to be beautiful Purple and Lavender Violets, with Yellow and Green Foliage. The Pattern is on both sides of the Teapot, as well as the Lid; and the Scalloped Rim, Knob, Handle, Spout, and Foot are all Trimmed in 22kt or 24kt Gold. Back Stamped with "Depression" of "Sadler-Made in England". A lovely Teapot for any Collector, or anyone who loves having Tea from a Porcelain Teapot. Great Condition. Vintage - Sadler English Porcelain Teapot, Ivory Background with Violet Bouquets, 22k Gold Trim, Ar5tist Mark "H" in Gold on Bottom, Circa 1940-1950. 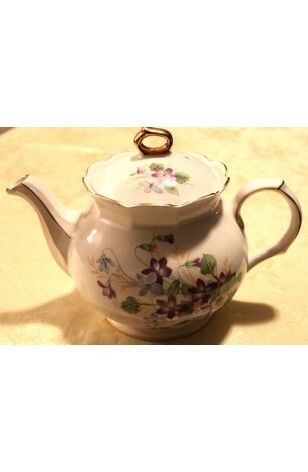 This Lovely Cream or Ivory Vintage Teapot, made by Sadler in England, has a Pattern that seems to be beautiful Purple and Lavender Violets, with Yellow and Green Foliage. The Pattern is on both sides of the Teapot, as well as the Lid; and the Scalloped Rim, Knob, Handle, Spout, and Foot are all Trimmed in 22kt or 24kt Gold. Back Stamped with "Impression" of "Sadler-Made in England. A lovely Teapot for any Collector, or anyone who loves having Tea from a Porcelain Teapot. Very Good Resale Condition, having no known defects.